QantasLink is a regional brand of Australian airline Qantas and is an affiliate member of the Oneworld airline alliance. It is a major competitor to Regional Express Airlines, Virgin Australia and Skywest Airlines. As of September 2010 QantasLink provides 1900 flights each week to 54 domestic and international locations. Product Description: Airline: Qantas Airways Aircraft Type: Airbus A380-800 R.. Product Description: Airline: QantasLink (Network Aviation Australia) Aircraft Type:&.. Product Description: Airline: QantasLink / National Jet Systems Aircraft Type: B.. Product Description: Airline: Qantas Link / Sunstate Airlines Aircraft Type: Bombardier DH.. Product Description: Airline: QantasLink / Sunstate Airlines Aircraft Type: Shor.. 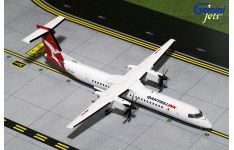 Product Description: Airline: QantasLink (Cobham Aviation Services Australia) Aircraf.. Product Description: Airline: QantasLink (Eastern Australia Airlines) Aircraft Type:&..
QantasLink / Sunstate Airlines DHC-8-402 Q400, in the 'Breast Cancer Awareness' colours, brought t..
QantasLink / Sunstate Airlines DHC-8-402 Q400, in the 'Taronga Western Plains Zoo' colours, brought ..